Saturday I co-hosted my best friends baby shower. And it was absolutely wonderful! Jenny and I decided we wanted to throw our best friend, Ashley a baby shower in El Paso in February back in September. We had a blast planning it. It all started with the invitation. Which we thought was the perfect mix of simple and cute. Ashley is having a girl and so we went with the traditional pink and white as out color theme. We flew into El Paso on Thursday night and gave ourselves all day Friday and all morning Saturday into Saturday afternoon to get everything ready. Now I could tell you everything, but it is so much more fun to show you! 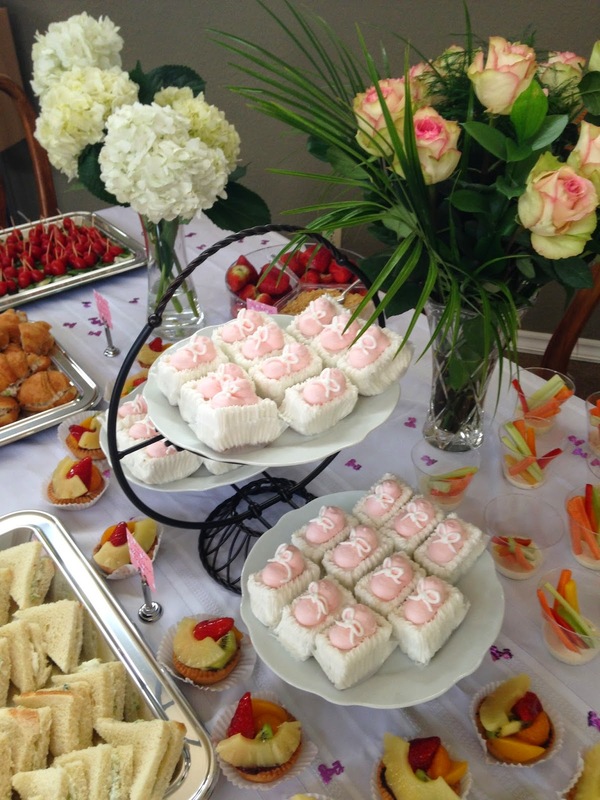 SO without further ado I give you, our Simply Chic and Pink Baby Shower we hosted for my best friend Ashley! We were bridesmaids in Ashley's wedding and now she's having a sweet baby girl!! We served: Vegetable Cups with Ranch Dressing, Strawberries and Cream Cheese Dip, Grape and Goat Cheese w/ Pecan Bites, Caprese Bites, BLTs, Cucumber Salad sandwiches, and Chicken Salad on Croissant sandwiches. For dessert we served fruit tarts and delicious petit fours. For beverages we bought personalized water bottle labels and put them on water bottles as well as a delicious Sparkling Punch. We added another little personal touch by putting everyone's name on their glasses. It was a huge hit and I highly recommend serving it at your next event. All the ladies at the shower loved it. 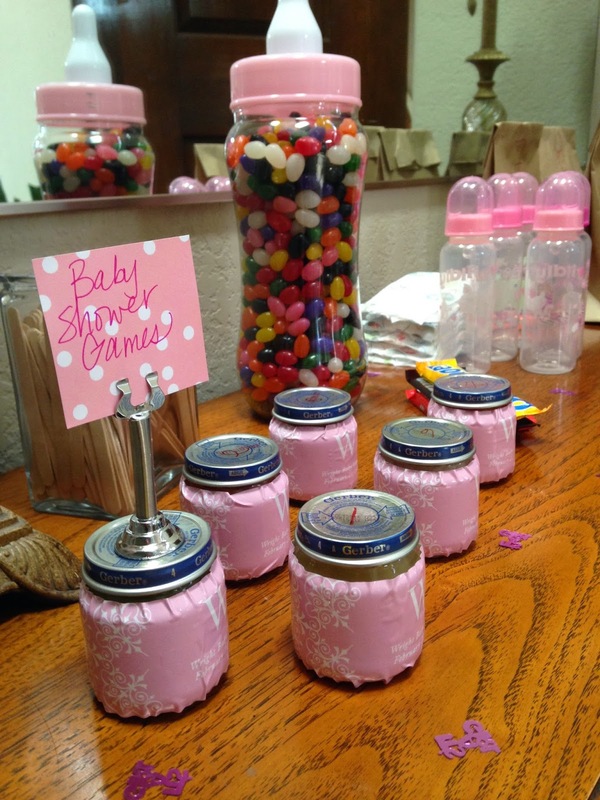 We played 5 different baby shower games. All of which were a blast! What Baby Thing is in the Bag? How Many Jelly Beans Are There? I made sure there were fresh flowers un as many places as possible. But especially on our main table. We bought a pretty bouquet of roses and my personal favorite, hydrangeas. I also bought a pretty spring bouquet for the front table. 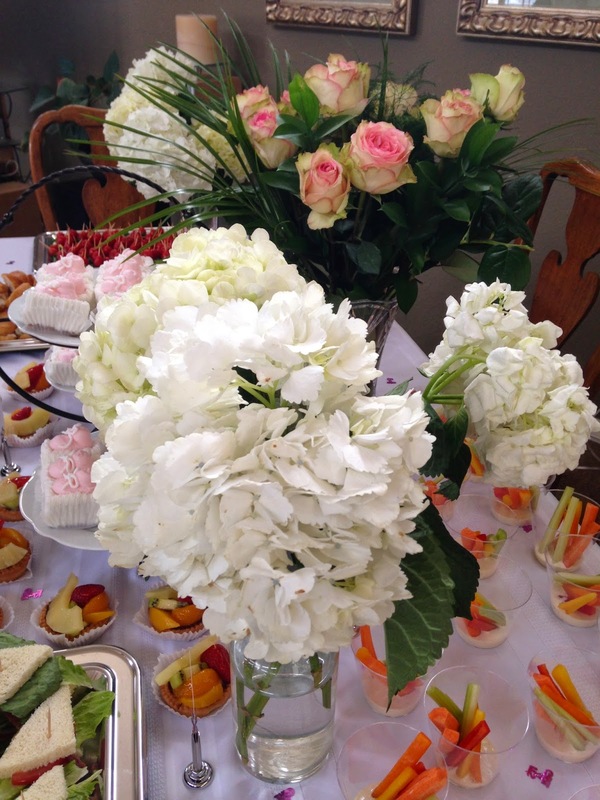 Fresh flower are a MUST for any event. A MUST! I made a garland for the mantle, where we decided to place all the gifts people brought. 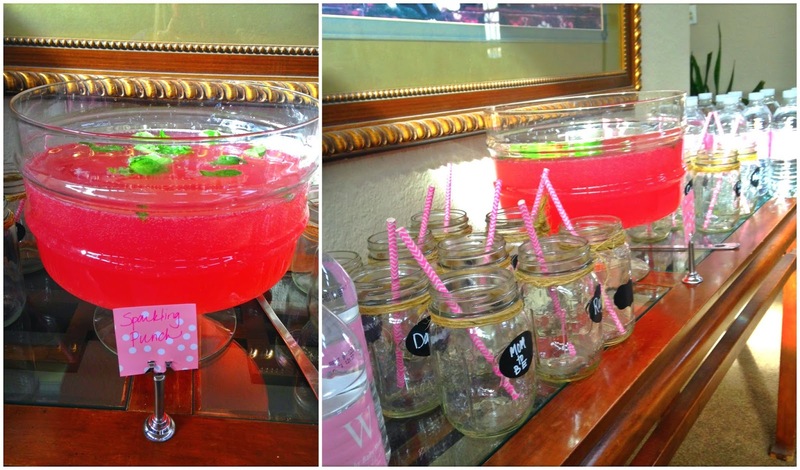 My friend Ashtyn had made one for her friend's bridal shower and she showed me how she did it. Y'all it was the easiest garland to make and you can expect a full tutorial on how I did it tomorrow! We had nice little turnout for the shower, if I do say so myself. Here is everyone playing one of the shower games. Here are the 4 brave contestants in our Pacifier Toss! Even out Mom-to-Be played along. I'm telling you it was the best game of the day. As party favors we gave each guest a cute little duck sugar cookie. Jenny snuck out to the front patio area and moved everything around and changed the sign before the guests started leaving. 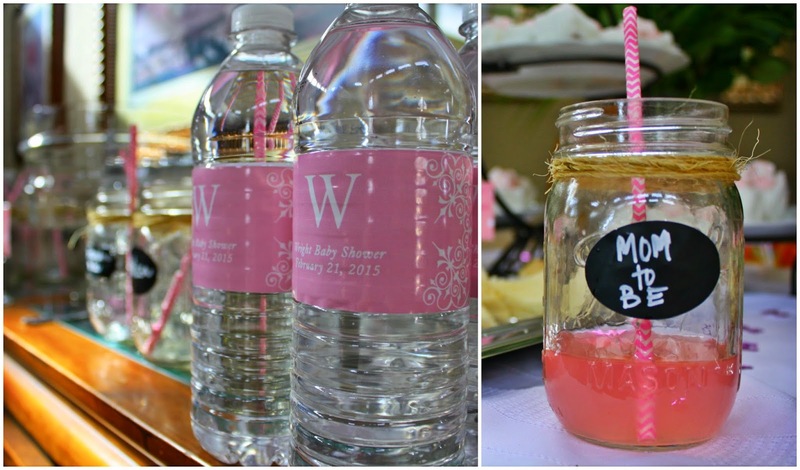 It was the perfect little touch to end a very lovely and fun baby shower! 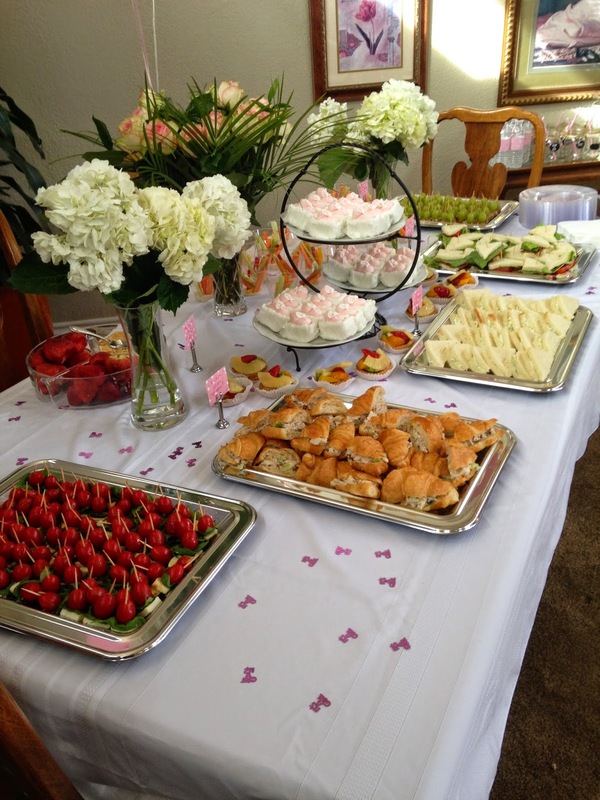 I absolutely loved our baby shower. To me it was perfect. And from the expression on Ashley's face and the fact that she cried I think she did too. I am so glad we got to do this for her. She is going to be the best mom ever and I cannot wait to see her shine in that role. I also cannot wait to meet Lacey! Which is what I will be doing the next time I head to El Paso. Ohhhhhh my goodness.... I should not have read this right before heading over to pick up my students. I am balling!!!! I love you so much and you are the best friend anyone can ask for. I cannot wait to introduce my baby girl to the best auntie she will ever have!! I LOVE YOUUUUU!!! !